A very reflective surface which light can bounce off of. She kept staring at the mirror all day. 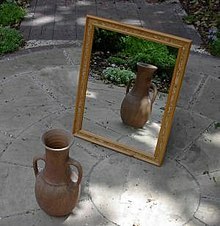 (transitive) If something/someone mirrors something, then it is identical to it. This page was last edited on 23 April 2017, at 23:54.